It's one of Praga Digital's 'trademarks' to harvest vintage and classic recordings and repackage and reprocess them at an approachable price. 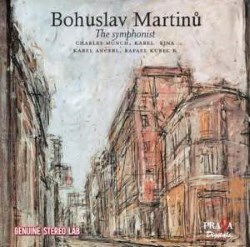 There's no change here and the orchestras and conductors in a set dubbed "Bohuslav Martinů - The Symphonist" have their roots deep in the Martinů seething mulch. The performances are not here presented on hybrid SACDs, despite what the rear cover indicates (my thanks to fellow reviewer Dave Billinge for identifying this error). While the exultant Fourth Symphony is the 'other' Turnovský version it scores highly for vigour and vim; a notch down from the Supraphon early 1960s version which can be had on Warner Apex. The Jan Panenka/Karel Šejna Supraphon version can be heard in all its tense and intense doom-laden glory. As a recreation away from the storm-clouds, and from the same fateful year, try Jiří Bělohlávek's Tre Ricercari. Relaxation indeed. Praga then migrate to EMI/Warner sources and give us Rafael Kubelik's spry and refulgently impressionistic Les Fresques de Piero Della Francesca. Last seen by me as part of a mid-price Kubelik collection and a mixed Martinů celebration - both twin CD sets. As I have written previously this version has "an irrepressible zest for life and a pleasing tension." Not content to leave things there, Praga move to another work from Martinů's fruitful years in the USA: his last Symphony. The Sixth Symphony was for quite a few years known only though this lovingly done Boston version and another contemporaneously on Supraphon from Karel Ančerl. In the Toccata e Due Canzoni there's a tension familiar from the Double Concerto - two works that gaze at each other across the dividing gulf of the Second World War and are products of two contrasting continents. The latter work is also magnificently hypnotic in a way similar to Allan Pettersson's much later Seventh Symphony. In this extremely fine work I still lean in favour of Zdenĕk Hnát and the conductor-less Prague Chamber Orchestra on an LP from Supraphon which was never issued on CD (Supraphon ‎– 1110 1619). The recording engineer for that neglected LP was Pavel Kühn. Hnát seems lost in the work in a way that Jaroslav Saroun vies with but does not equal. The last work on this generously packed set is The Parables and this, as John Quinn reminds us, is a late work written in the penultimate year of the composer's life. These three Parables are inspired by two writers Martinů thought very highly of: Antoine de Saint-Exupéry (such a pity Martinů did not live long enough to consider tackling an opera based on this writer's The Little Prince) and Georges Neveux, the writer behind the opera Julietta (all the relevant texts are printed in the booklet). This Ančerl performance, imbued, as John says, with "a valedictory ecstasy" is kaleidoscopically impressionistic. The notes for this set are fulsome and have a shorter French version alongside the much longer English essay. The recordings are not the last thing in sophistication but they do not sell the music or the music-making short. The sound has the amicably belligerent power to induce meditation and enthusiasm.